April 30, 2012 - bursary application deadline. May 21, 2012 - deadline for abstracts for presentation proposals. May 21, 2012 - deadline for early bird registration discount. June 1, 2012 - deadline for preprints to be in the printed program. June 29, 2012 - deadline for discounted hotel reservations. July 15, 2012 - evening reception at the hotel. July 16, 2012 - LaTeX workshop (concurrent). July 16-18, 2012 - conference. 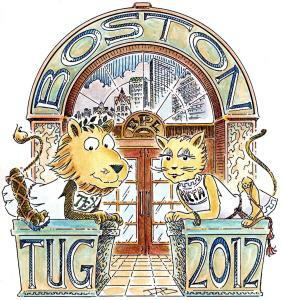 July 30, 2012 - deadline for final papers for TUGboat proceedings. Transportation information provided separately, along with lots of other information on visiting Boston. Rooms are reserved for TUG conference participants at the Omni Parker House in downtown Boston. You can reserve online (code 071512TUG201212, but it should be filled in automatically) or by phone (800-843-6664 in the US, or +1 617-227-8600, mention the “TUG 2012 conference”). Our discount rate is $145/night, regardless of single/double/triple/quad occupancy. It is available until June 29. If discounted rooms are not available when you book before then, please contact TUG so we can make more rooms available. Book early! The discounted rates are available for up to three days before and after the conference, subject to availability. Meals: Free Sunday night reception at the hotel (July 15, 5-7pm) and a banquet (optional extra) on Tuesday evening (time and location tbd) . The registration fee includes a breakfast with a set menu in Parker's Bar (7-9am), as well as lunch on each day of the meeting and morning and afternoon coffee breaks. Sponsored by the TeX Users Group and DANTE e.V., with additional support from CSLI Publications, O'Reilly, River Valley Technologies (UK), River Valley Technologies (India). Thanks to all. Conference committee: Steve Peter, Robin Laakso, Karl Berry, David Walden.